Here, the nitrogen and oxygen in the nitrate ion undergo oxidation and reduction to from nitrite and diatomic oxygen, respectively. Does this count as a redox reaction since the same polyatomic ion undergoes both? In my text book, it says that when an element in a molecule or polyatomic ion undergoes reduction or oxidation, we refer to the entire molecule or ion as being reduced or oxidized. I don’t know what effect this has on this reaction though. Any reaction in which one atom/ion loses some electrons and any other atom/ion gains those electrons is a redox reaction. In your particular example, the oxygen atom is losing its electrons and the nitrogen atoms are gaining those electrons. So, it is definitely a redox reaction. The reaction in which atoms from the same species are oxidised and reduced are called disproportionation reaction. So, the same reaction is also a disproportionation reaction. In both of these examples, the same molecule/ion/atom undergoes an oxidation as well as a reduction, so these are also disproportionation reaction. 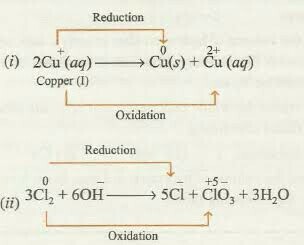 Note that every disproportionation reaction is a redox reaction. Why isn't hydration an oxidation reaction?